We all know that SIP technology provides ample benefits and opportunities for the user to save money whilst increasing productivity. However, these types of systems also create more opportunities for fraud attacks. As SIP technology becomes more widely adopted, fraud threats have grown as well. Ensure that CSPs have put all the necessary controls to keep their operations safe and secure. 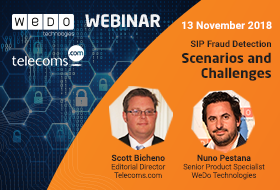 Understand some of the measures that you can take to prevent SIP fraud and detect fraud based on call signaling information even before the call begin.